The BBC Good Food Show Northern Ireland is coming to Belfast’s Waterfront Hall from 14-16th October 2016 and promises to be one of the highlights of Northern Ireland’s Year of Food & Drink, marking the first time that the flagship event will be hosted anywhere in Ireland. To celebrate, BBC Good Food Show Northern Ireland are offering TheTaste readers 15%* off tickets to the Show. Just quote TASTE when booking. And there has never been a more delicious time to visit Belfast! The city is home to two Michelin starred restaurants, trendy cafes, award-winning eateries and lively cocktail bars, all making for a thriving food and drink scene. For three days, the BBC Good Food Show will treat foodies to a host of culinary delights. The Supertheatre is the highlight of the show, where you can watch the best celebrity chefs in the business cooking delicious dishes live. Get tips for tasty, seasonal food and plenty of culinary inspiration in this entertaining live show. 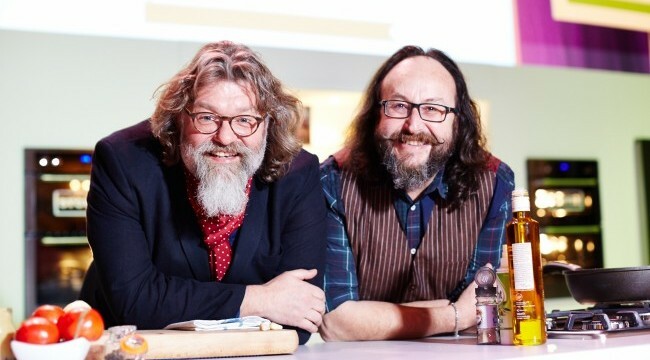 Bake Off favourite Paul Hollywood and the legendary Hairy Bikers are just some of the top names taking to the stage. Local hero Paul Rankin will be leading the Northern Ireland Year of Food and Drink sessions, cooking delicious seasonal recipes with locally sourced ingredients while local produce comes to the fore at the Food NI Pavillion and Producers’ Village. And don’t miss the chance to pitch your culinary queries to the celebrity panel at the Interview Stage. Away from the hustle and bustle of the BBC Good Food Show, Belfast has so much to offer to food aficionados. Sample the best of Belfast with a food tour – Both Taste & Tour, led by self-professed foodie Caroline Wilson, and the theatrical Belfast Bred Tour* will introduce you to some local culinary champions – giving you a true taste of Belfast. *Summer Operation Only. Last tour – 10 September 2016. Alternatively, cook up a storm in the kitchen! Make your way to the Belfast Cookery School in the heart of the city and try your hand at making some delicious dishes under the guidance of an expert chef. With classes available for all ages and levels of experience, it’s a great way to enjoy and learn more about food with plenty of Belfast ‘craic’ guaranteed! Ask anyone about the food scene in Belfast and St George’s Market will crop up in conversation. Built between 1890 and 1896, this weekend variety market is a must see. You can find almost anything here from crafts to antiques, but if food is your thing, then Saturday mornings are the best time to visit. And no visit to Belfast is complete without taking in the historic Titanic Quarter – the birthplace of the world’s most famous ship and home to a wealth of maritime history. Visit the world’s largest Titanic exhibition, Titanic Belfast, and discover the story of this famous ship. Or step aboard her ‘little sister’, the SS Nomadic – the tender ship that transported first and second class passengers from Cherbourg to the Titanic. Belfast is the hottest ticket in town and with the BBC Good Food Show to look forward to, it’s the perfect excuse for a weekend break. How else are you going to work your way through Belfast’s menu of quality restaurants and authentic bars? We recommend you bring your appetite! Visit discovernorthernireland.com for plenty of ideas and to begin planning your next short break. For ticketing and further information on the BBC Good Food Show Northern Ireland, click here. *15% discount valid on advance tickets only. Not valid on VIP or with any other offer. Ends 16/10/16. £1.95 fulfilment fee per advance booking. Not all celebrities appear at all Shows or on all days.